Wash and scrub potatoes clean; cut them into quarter chunks. Place into pot with water and bring to a boil until fork tender. This should take about 30 to 35 minutes. When they’re cooked through, the fork should easily slide into the potatoes with no resistance, and the potatoes should almost, but not totally, fall apart. Drain the potatoes in a large colander. When the potatoes have finished draining, place them back into the dry pot and put the pot on the stove over low heat for about 1-2 minutes. This allows all the steam to escape, before adding in all the other ingredients. Turn off stove and add butter, garlic,Parmesan cheese and Italian dressing mix. Carefully toss potatoes until well coated and throw a few pats of butter over the top. Garnish with some chopped parsley for color (optional). Posted on July 15, 2012, in Lady Fab Cooks and tagged dinner, food, Italian salad seasoning mix, minced garlic, parmesan cheese, red potatoes, side dish, the porter house grille, vegetarian. Bookmark the permalink. 2 Comments. 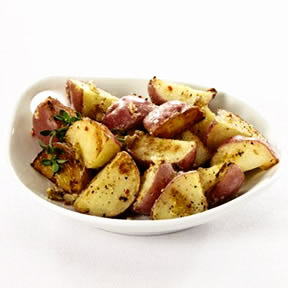 If you are a potato lover, this will bring a welcome delight to any steak or roast dinner. Truly second are in order. Bon appetit. A quick dish for an elegant meal.